History : 03/18/98 : Acquried 2 CPUs. 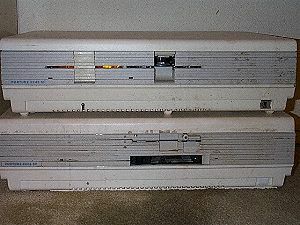 An SX model and an XP model. 09/17/98 : Acquired parts of another system and some docs for free. Just received these. I don't have the Fortune Terminals for these nor the special monitor or keyboard for them. Also need doc and any software anyone may have to pass along. Please email me if you have any info on these. I've received another system in pieces and some doc. Could still use the monitor/keyboard units.